Southern American writer William Faulkner signed first edition, first printing of his ''Sanctuary,'' published by Jonathan Cape & Harrison Smith: New York: 1931. The winner of the Nobel Prize for Literature and two-time Pulitzer Prize-winner inscribes the fly-leaf: ''Dr. A. J. Liebmann / William Faulkner / New York / 17 March 1943'' in black ink. Faulker's dark tale of murder runs 380pp., bound in gray cloth boards with fuchsia paper accents and fuchsia lettering. Top edge black. Slight wear to board edges and minor cocking to spine, else near fine. 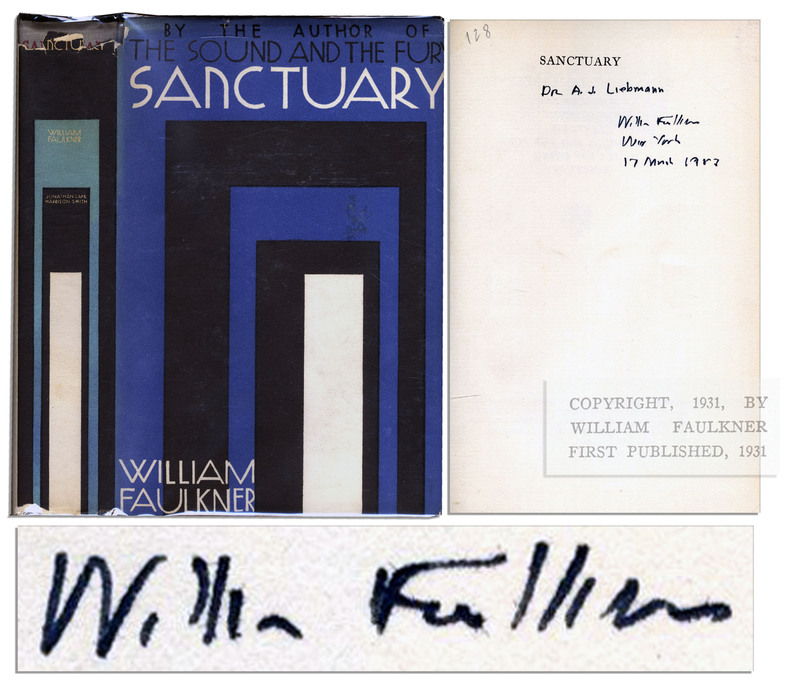 The scarce, original dustjacket features a geometric printed design in black, white and blue. Negligible staining to panels and light wear to the edges. Chipping to the top edge of the spine leaves with small paper loss. Very good condition.